Enrich your bathroom ambience with this upscale 48 inch vanity paired with the 49 inch Lily White engineered stone top. With an understated Grey finish and a clean, sleek profile, this modern piece has an understated elegance that will impress homeowners and guests alike. Two large cabinet doors with soft-stop bumpers and three left-side drawers open up a bevy of storage options for linens and bath essentials, setting the tone for a tidy powder room. The sturdiness and craftsmanship of this vanity cabinet will make you think it is custom-built, while small details like leg levelers instill confidence for perfectly stable setups. Gaze through the Foremost Ashburn collection for complementary Grey items like wall cabinets and mirrors for a complete bathroom makeover. 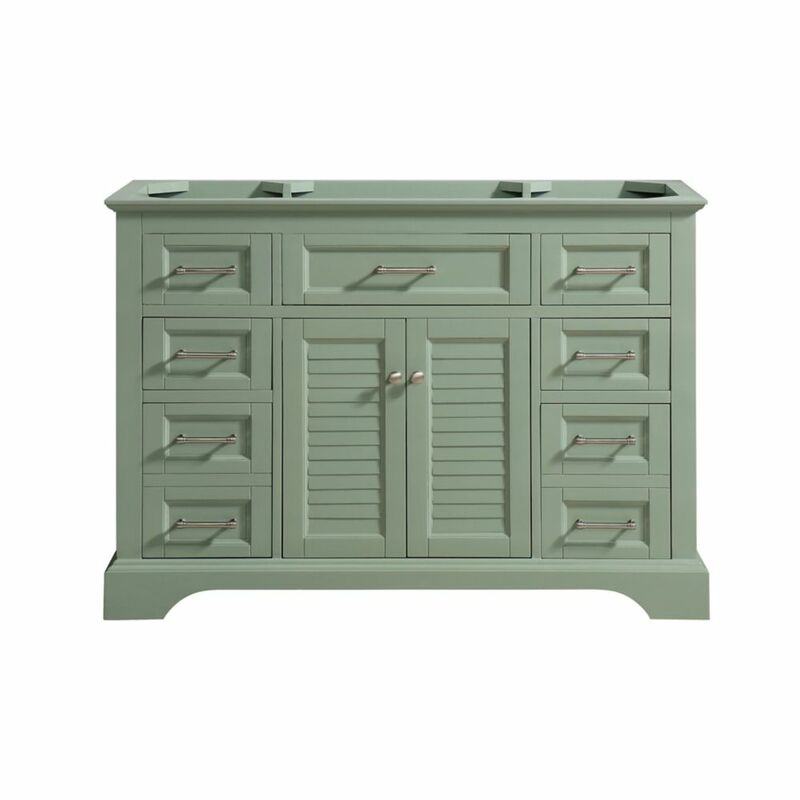 Colton 48 inch Vanity Only in Basil Green The Colton 48 inch vanity captures attention with its stunning Basil Green finish, brushed nickel hardware, and lovely louver doors. But Colton's construction is equally as compelling. Solid birch wood frame, dovetail joints, soft-close glides and hinges, plus flip-down drawers beneath the sinks means Colton delivers quality in both form and function. Complete the look with matching mirror and linen tower. You cannot miss with Colton.